December 14th, 2015 September 9th, 2016 UnaXComments are off for this post. Lately I’ve been trying to catch up on the different Marvel films, that I’ve missed over the last many years. 3 years ago the big hype on the internet was The Avengers and you were hard put to visit reddit, imgur, Twitter and even Facebook without people writing about it, posting GIFs and other things from the film. I mean, who don’t remember this fantastic scene? This Friday, I finally took myself the time to sit down with my wife and watch The Avengers, being only 3 years later than all the hype. It was good, not the best film I’ve ever seen, but I was entertained none the less. This came after I watched Captain America: The Winter Soldier a few weeks back and before that I had watched Iron Man, Iron Man 2, Iron Man 3, The Incredible Hulk and Guardians of the Galaxy (not necessarily in that order) and also some of Marvel’s Daredevil on Netflix (Only the first 3 episodes as I found it a tad gritty for my likings, but I haven’t yet ruled out that I might get to watching all of it at some point). What I got from watching Captain America: The Winter Soldier before I watched The Avengers, was that apparently Earth (namely New York, which always equals the entire Earth in films) had been destroyed by an alien attack. The problem was that I hadn’t seen that happen and had no idea exactly what had transpired. The same issue arose when I was watching Iron Man 3. This meant that I was rather confused and then decided to set myself a mission. A mission I’ve dubbed ‘The Perfect Marvel Mission’. 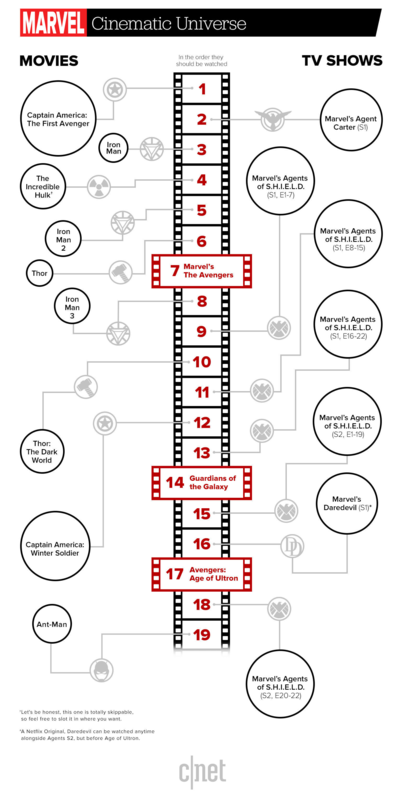 I know that I’m in no way the first person to do this, that would just be silly to think, but now I want to get into the right chronology before Captain America: Civil War arrives next year and Guardians of the Galaxy 2 arrives in 2017. To do this I want to watch all the films in the correct order (I’m going to skip the shows, as I consider myself only a moderate fan and films which are 2 and half hour in length is easier to digest). I guess it’s about time to get back to writing about technical stuff again and I might have something in the pipeline as I’ve started developing an Android app, that might be useful to write about. Not only that, I’m also back to working on using my Raspberry Pi Home Server and I might have something to say about that. Finally I’ve also fiddled with making a nice World of Warcraft add-on, that can make statistics about XP gained, time to level and other information when being boosted in an instance by a high level character. Just because I could. Stay tuned or don’t, that is entirely up to you.